Excavation and basement concrete work have begun for the new law offices of Jarecki Yosten, P.C., L.L.O. A building permit for construction of a new law office in Albion was affirmed by the Albion Board of Adjustment last Tuesday, April 25. 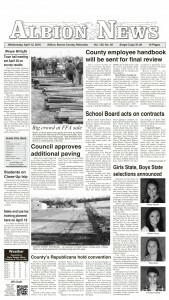 On Friday, April 28, a motion was filed in Boone County District Court, seeking to halt construction of the building. 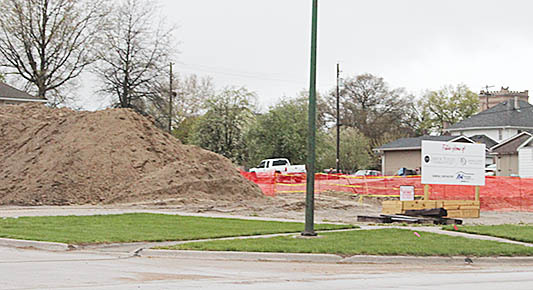 The controversy involves the new law offices for Jarecki Yosten, P.C., L.L.O., now under construction near the Fifth and State Streets intersection in Albion. An initial hearing was held Tuesday in District Court on the motion for restraining order, Kraus vs. Zoning Board of Adjustment, filed by attorney George H. Moyer, Jr. on behalf of Trent Kraus. The city was not notified of the motion for restraining order until Monday. Preliminary arguments were made Tuesday, but Judge Rachel A. Daugherty continued the hearing date to Friday afternoon, May 5. Details in the May 3 Albion News Print and E-Editions.